It’s a Wonderful Life is one of those masterpieces which has both become a Christmas classic and has withstood the test of time. While there are a number of great and magnificent films, not many have even been around long enough to face a similar test of time, and many younger ones have failed said test. I particularly appreciate: when it first came out, it was pretty much just another movie, and it did fade away for awhile. But then a little bit of luck, involving a studio failing to maintain its copyright and thus letting it slip into the hands of several television broadcasting companies, brought the tale of George Bailey back into the spotlight, and everyone loved it. It has been a Christmas favorite ever since. We first hear the name of George Bailey on Christmas Eve, when his friends and family are praying for him. Their prayers rise up into the heavens, where God hears them and sends an angel, Clarence, down to save the man in question from the suicide he is seriously considering. Before Clarence goes, however, another heavenly figure, Joseph, sits Clarence down to review George Bailey’s life, that he might understand what has led George to this terrible contemplation and what could get through to him, to convince him to keep on living. George has, from the beginning, lived a humble life. But he has been incredibly selfless with his all. When he was twelve, he jumped into a freezing river to save his little brother’s life, an act which cost him the ability to hear in his left ear. He was even calm while doing so, shouting instructions to their friends on how to help. A few weeks later, his suspects that his part-time employer, Mr. Gower, has accidentally, while suffering from the grief of losing his son to the Spanish Flu, put poison into the medicine meant for a child, and saves the man from his colossal mistake, never telling anyone about the incident. And all this while being perfectly unaware of a young girl being in love with him and perfectly defiant in the face of the richest man in town, a man who’s trying to own the town, Mr. Potter. Years later, as George is about to set out on a whirlwind tour of the world, then to go to college and become an architect and build cities and skyscrapers, and be forever gone from the little town of Bedford Falls, tragedy strikes. He doesn’t want to be trapped in a “shabby little office” trying to save every last penny in order to pay the bills, but when his father dies, and his office, the Bailey Building and Loan, is about to be shut down by Potter, George sacrifices everything he wants for himself to keep the office open. He even sends his brother Harry to college with his savings. He’s smart and ambitious, but most of all, he is selfless. Again and again, throughout his life, George Bailey makes this same sacrifice. When Harry returns from college with a wife whose father wants to hire Harry, Harry is willing to take George’s job, let him get out of Bedford Falls, but George keeps his job and lets Harry get out instead. When George marries a young woman named Mary, they give out their savings, their honeymoon fund, to help people survive long enough to make ends meet, as this is during the Great Depression. Instead of leaving, taking everything the world has to offer, even when offered by a childhood friend, George finds himself living in an old shack of a house, large but worn. Instead of building cities and skyscrapers, he’s building small, affordable homes for the people of his small town to live in, much more preferable than Potter’s slums. Yet, for his humble life of penny pinching, he proves a consistent thorn in Potter’s side. He proves so aggravating to the old miser, and a subtle threat to his business, Potter decides he must take action. Crisis after crisis, George carries his business through, slowly improving the lives of everyone in his home town, cutting ever so slightly into Potter’s profits, and with potential to undercut it as well. Thus, Potter tries to tempt him with the aforementioned “everything the world has to offer.” He makes a good case, almost seducing George to his side, but ultimately failing. And boy, this, more than anything else, has to gall Potter. It galls him so much that years later, at the slightest opportunity, he steals the money George’s Uncle Billy brought into the bank to repay a loan, when said Uncle accidentally loses it in a cocky, careless moment. Then he swears out an arrest warrant for George, and tells him, a man at the end of his rope, that George is worth more dead than alive. And so it’s done. George returns to his own life. Sure, he’s about to go to jail, but he doesn’t care, because he’s had a wonderful life. So wonderful, in fact, that he finds himself the recipient of everyone’s returned love, as he has loved them. He helped them, now they help him, everyone giving just a little something they can afford, some of them giving every penny to this great man who has lived his whole life in a crummy little town, building their homes. The amount collected is exponentially higher than the money owed. At last, George Bailey, himself, the man who saved others his entire life, is saved. The themes of this classic are crystal clear, and these are what make the movie great. These are why it has withstood the test of time. The man of humble means, who gives lifelong service to his community and his loved ones, is far richer than the richest man who is alone. The man who keeps his wits and works hard can live a free, happy life, giving good to the world. The man who is barred from military service can still support and protect the soldiers, their families, and their homes. It’s not glamorous or in the spotlight, but someone needs to guard the home front. The man who does good will have that good repaid in his hour of need. There is no shame in asking others for help. God watches over and cares for his children, knowing each one by name, knowing how to help, hearing prayers, and answering. 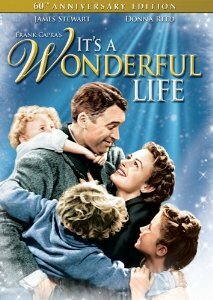 This entry was posted in Movies, Tuesday Review and tagged George Bailey, It's a Wonderful Life. Bookmark the permalink.